I agree. I really hope they do some small scale infill in the East Quarter to match the existing older buildings. That whole Eastern end of downtown could turn into an awesome area of the city. Smart District needs more residential development to help make that complete. Lots of opportunity to do that, not sure why something hasn't been proposed yet. Tnexster wrote: Smart District needs more residential development to help make that complete. Lots of opportunity to do that, not sure why something hasn't been proposed yet. They are waiting to see what Amazon is going to do. Mike Hoque said construction of phase 1 should kick off by the end of 2018, but we'll see. I wonder how many decisions out there are being help up by Amazon? The sunscreen thing is something that bodes well for defining a safe space for pedestrians. The Winspear height is a little too tall for what I am referring too but the AT&T height looks like two stories tall which helps the pedestrian-oriented areas seem less intense. Most of these 80's office towers go straight up with their exteriors and don't define a base to the buildings like older buildings did. This can make the buildings look overbearing and overpowering making sidewalk areas seem more desolate and uninviting. While older historic buildings did define a base area around the ground floor so they tend to do a better job encouraging a sense of place and less like a highway trophy, a well known Dallas architecture trait. Renaissance Plaza remedied this when it was majorly remodeled shortly after it opened. Originally it was a straight vertical box of modernism without the frills of design features that didn't serve a "functional" purpose. Then the new owners added decorative details around the base of the building that brought the scale of it down so when a person walks up to it you feel less like you are competing with the entire buildings height. Thanksgiving Tower almost fixed this is as well during their renovation but I am assuming the planned patio covers were cut for the sake of the budget. They would have made the patios much more attractive and more inviting. Right now you go sit outside of Ascension at Thanksgiving tower it's desolate and frankly too tall and doesn't invite you to spend time. Even a cluster of trees would have worked similarly. I am glad AT&T is making these kinds of contributions to define space and create levels/rooms all over their plaza space. cowboyeagle05 wrote: Right now you go sit outside of Ascension at Thanksgiving tower it's desolate and frankly too tall and doesn't invite you to spend time. Even a cluster of trees would have worked similarly. I was in that area last week and the lack of shade is a major problem there. Just hot blazing sun hitting the concrete. Every block in Downtown Matters. The sidewalks are wide enough in most places for the city to add trees. We need more trees. They added trees in front of Thanksgiving but it will be a while before they have any value and all the other ground cover is hardscape rocks and colored concrete. AT&T's landmark headquarters tower and plaza in downtown Dallas has been bought by well-known Dallas investors Tom Dundon and Jonas Woods. CBRE announced the purchase Wednesday morning by Dundon Capital Partners and Woods Capital of the 37-story, Class A office tower. The 965,800 square-foot building is the central point of AT&T's global headquarters campus. Located on the southeast corner of Commerce and Akard streets, One AT&T Plaza is fully leased to AT&T through August 2030. It has been the company's headquarters since 2008, when AT&T moved to Dallas from San Antonio. "We are excited to continue our commitment to Downtown Dallas with this investment in the global headquarters of one of the most dynamic, highly profitable and well managed media and entertainment companies in the world," said Tom Dundon, chairman and managing partner of Dundon Capital Partners. Jonas Woods, president of Woods Capital, praised AT&T for "leading the way in downtown's revival" with substantial investments. "We believe that AT&T shares our vision of downtown becoming one of the most vibrant neighborhoods in Dallas. We look forward to working with AT&T and continuing to participate in the dramatic growth of downtown," Woods said. Ground floor renovations under way at the property are part of the $100 million AT&T Discovery District project to transform the neighborhood into a popular downtown public space. Upon completion, several city blocks will be converted to pedestrian-only access and neighborhood amenities will be added, including 40,000 square feet of restaurant and retail space, a proposed two-story food hall with balcony dining, outdoor gathering and performance areas, a water garden and a six-story video wall facing Commerce. The partnership between Dundon Capital Partners and Woods Capital bought the property from Icahn Enterprises for an undisclosed price. I am just glad we will have local owners of the property. 90% of the rest of office properties in Downtown is owned by large multinational companies largely not invested in Dallas in the same way as a local company like Woods Capital can be. It is always interesting to me how corporations like AT&T just don't want to own their own HQ particularly when they care this much about its ability to attract talent that they are spending millions of their own money on campus renovations. I'm only saying this because I heard form a director-level employee at AT&T that if everything goes to plan they do expect to move some sort of newsroom/broadcasting capacity from CNN Center to the Discovery District, which would be pretty amazing even if it's just a small studio like WFAA at Victory Park. 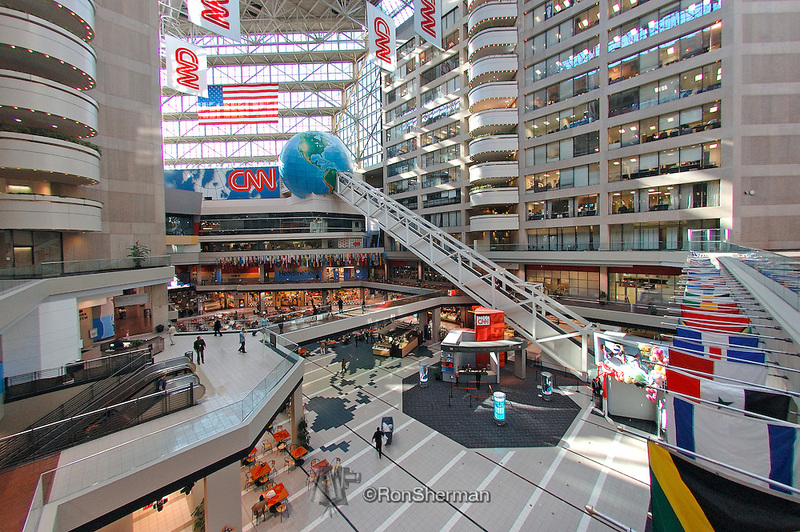 On an unrelated note, I was looking through photos of CNN Center in Atlanta and didn't realize how much it looks like Plaza of the Americas, down to the ice skating rink that was removed to expand the food court (bonus points if you knew this was the location of the "World of Sid and Marty Krofft" theme park that only lasted 6 months). I wonder if AT&T will add their new concept to the District... Looks pretty cool! That really does look like Plaza of the America's, was that built about the same time? A lot of office projects were built at that time with those giant atriums. It was popular for malls and office buildings at the time. Along with the food courts. The office building versions were devoid of less roaming teenagers though. Tnexster wrote: That really does look like Plaza of the America's, was that built about the same time? I looked it up last night, the complex that is now CNN Center was finished in 1976, while the Plaza of the Americas project started in 1978 and opened in 1980. So, not too far apart in age. cowboyeagle05 wrote: A lot of office projects were built at that time with those giant atriums. It was popular for malls and office buildings at the time. Along with the food courts. The office building versions were devoid of less roaming teenagers though. Yep, and don't forget the hotels too. Embassy Suites is a big one that comes to mind. Also the Reunion Hyatt and many other buildings built around the 35/stemmons corridor. Very true that it was an architectural fad, but once you see them both with the skating rink it's a little creepy. Road closures and other changes begin tomorrow Oct. 6 per an email from DowntownDallas Inc.
AT&T is adding the Interurban to the Discovery District area, but current building residents get to stay put (supposedly). The last paragraph of the article does mention AT&T looking at the Interurban for additional parking availability. What an absolute shame if the destroy a 1916 building for parking. A step backwards for Dallas in all possible ways. Tivo_Kenevil wrote: What an absolute shame if the destroy a 1916 building for parking. A step backwards for Dallas in all possible ways. The building is a landmark. So, it’s not going anywhere. I know there’s a pretty big parking garage attached to the building. Maybe that’s what they’re interested in. Hopefully, they can put in some retail where the old Urban Market use to be. Is there anything AT&T can do to get around this? I just think we need to be aware and engaged to make sure they don't team up with the city to pull a fast one. AT&T has incredible pull with the city. Also, can they technically convert the interior to parking while keeping the exterior? That would be almost as sad as demolishing it considering it's currently residential, and has just been remodeled/updated in a historically sensitive way. Honestly, I was thinking the same thing. I doubt that the interior is landmarked as well. It kinda makes you wonder. I hope that’s not the plan! If AT&T wants it for parking they could demolish and rebuild the current garage that wraps around the building and extend it all the way to Ervay (and/or go underground/higher)... all without touching the apartments. The current garage is awkward to navigate and was built in 1965 where the old interurban platforms were located. Demolition of the current garage would remove the old grocery space but if ground level retail was added it could activate three sides of the Jackson/Ervay/Wood block. The Browder Street Mall on this block has horrible aesthetics thanks to AT&T's giant vehicle ramp. Use the opportunity to consolidate/relocate all the ramps to a space within one garage and out of the pedestrian realm (since Jackson Street will be closed to Lane Street and Six AT&T will lose street access). If AT&T wants it for parking they could demolish and rebuild the current garage that wraps around the building and extend it all the way to Ervay (and/or go underground/higher)... all without touching the apartments. The current garage is awkward to navigate and was built in 1965 where the old interurban platforms were located. Demolition of the current garage would remove the old grocery space but if ground level retail was added it could activate three sides of the Jackson/Ervay/Wood block. The Browder Street Mall on this block has horrible aesthetics. Funny you mentioned about possibly extending it all the way to Ervay. That was my first thought as well and I jumped on DCAD to see who owns it a few hours ago. Unfortunately, it's not the same as the Interurban building, but perhaps ATT is thinking of moving that way. Those parking lots, along with their neighboring garages, have always created a total dead zone over there. If that does end up being the case, I'd be pretty happy with that result. They would just replacing an older garage with a newer one, which will likely be an improvement to the surrounding street-level. I wonder if they'll change the name ("Seven AT&T"?). I just saw the 88 and remembered the good times, back before the turn of the century when the Cowboys were good. I cannot believe it's been so long since the Cowboys got deep into the play offs.... The corporate presence of galactic ATT really should turn into a cornerstone for this side of town - more like the Cowboys with Emmitt, Troy and Michael instead of the ridiculous teasers we've had for the more than 20 years since then. Overall I think AT&T was tired of waiting for the rest of Downtown to blossom with retail needed to make the area popping for new recruits. DowntownDallas Inc has been cheerleading a shopping district anchored by Neimans for decades now and its been full of starts and stops. AT&T needs to snag and keep new recruits and can no longer wait for other investors to provide that boost to their property. Headington threw in some very pricey options but nothing that seriously creates the energy to snag AT&T what it really needs. Even Neiman Marcus has retail space in their nearby garage that looks like a homeless shelter with plywood covers over windows and rapidly deteriorating sidewalk. AT&T is taking the horse by the reins here and trying to create enough space in a concentrated area that they can lease to some lasting retail/shopping tenants that make their campus active. You can't just throw one quarter size grocery space in a dead zone and expect a marketplace of shoppers to show up as the city hoped would happen in the past. You have to have enough space to create a bubbling effect of customers that feed off each other. Like any Mall, AT&T is definitely trying to make sure they have enough square footage to create an energetic marketplace. An AT&T store and an Einsteins Bagels isn't enough. 7 hotels on Commerce with people looking for something to do at night—a good number of them should find their way here. Just drove past this site and noticed they have started on the canopy structure along Commerce, at least the section that juts out from the building. I believe there's another section that'll be anchored to the ground, but haven't see that yet. Did anybody go to the AT&T Discovery District event on Saturday in Downtown? Apparently they shared new renderings and gave an update on the progress. Would love to hear any new details!